The Psych Ward has been two years in the making and it could not have been finished if it was not for the amazingly talented team we had behind us. A huge shout out goes to the team at Diablo Sound, who came to our rescue and got us to the finish line. They also provided us with the hilarious, hardworking, and amazing programmer Fernando Vasquez, who we can not thank enough. He listened to all our crazy ideas and made them come to life. The Psych Ward would not exist if not for him. I also want to give a huge thank you to Lauren Orgill who came almost every day and did any odd job asked of her. We also would not have been able to complete this game if it was not for her wonderful ideas, support, and constant help. This game took a lot of hard work and long hours, and we want everyone to be recognized for the great work that they did. Thank you again for everything! We did it! Luke Rhoades, Madison Rhoades, Lauren Orgill, Blake Orgill, and Matt Rhoades. Fernando Vasquez, Drew Dalzell, Fionnegan Murphy, Noelle Hoffman, Brittany Cobb, Lauren Orgill, Blake Orgill, Jason Sakal, Zach Dahm, Geoff Durham, Donnie Buckingham, Jose Mendoza, Kerri Hellmuth, Sara Strain, Ruth Rhoades, Theresa Rhoades, Tony Croupe, Liz Croupe, Marissa Bergman, and Cooper Floors. 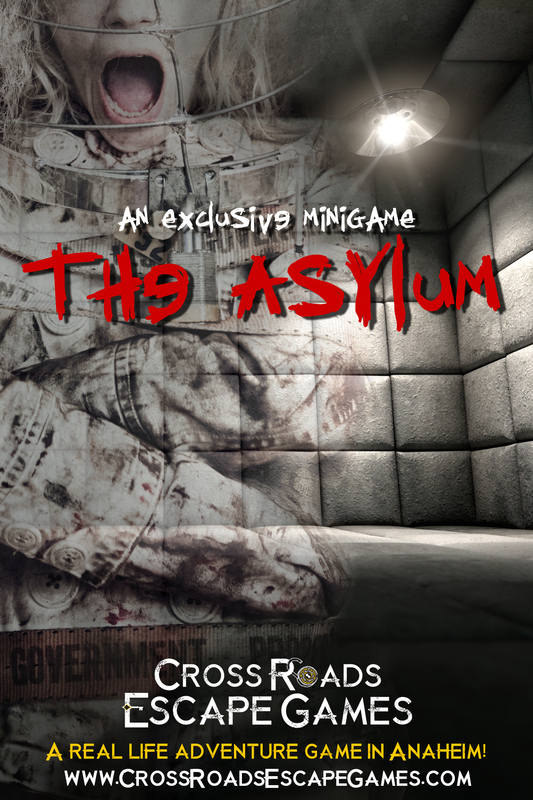 It’s time to say good-bye to our amazing 10-minute mini-game, The Asylum. Don’t worry though, you still have ONE LAST CHANCE TO PLAY! Join us on July 28thand 29that Midsummer Scream in the Long Beach Convention Center. We will have nurses there ready to lock you away! The mini-game is free to play with the purchase of an admission ticket to the convention. 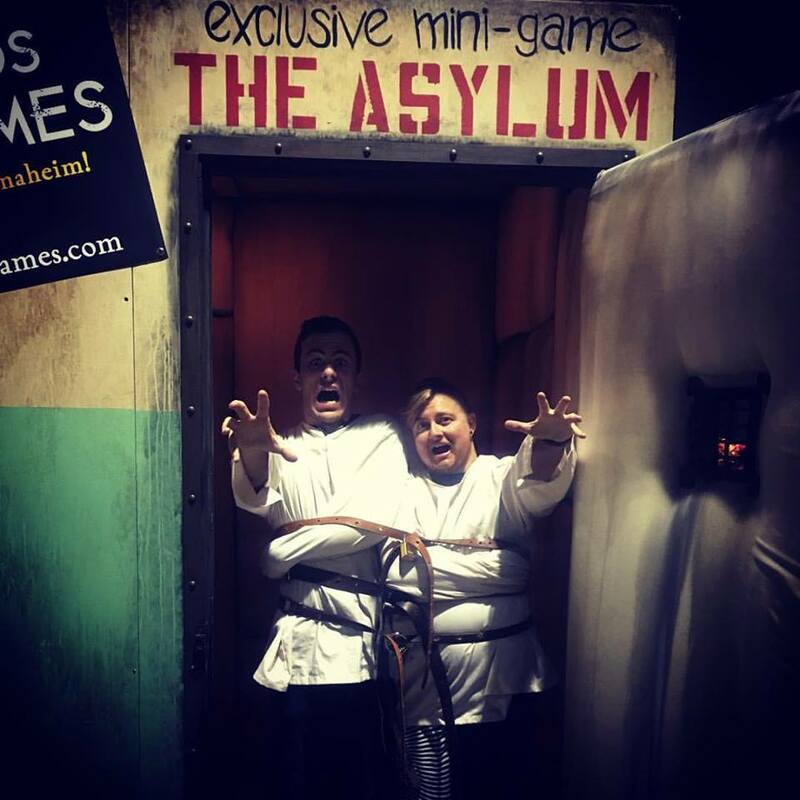 WE WILL BE OPENING THE ASYLUM MINI-GAME FOR GROUPS OF 2 EVERY 15 MINUTES DURING THE OPERATING HOURS OF THE CONVETION! ARRIVE EARLY TO SIGN UP FOR A TIME SLOT TO GUARINTEE YOUR CHANCE TO PLAY! 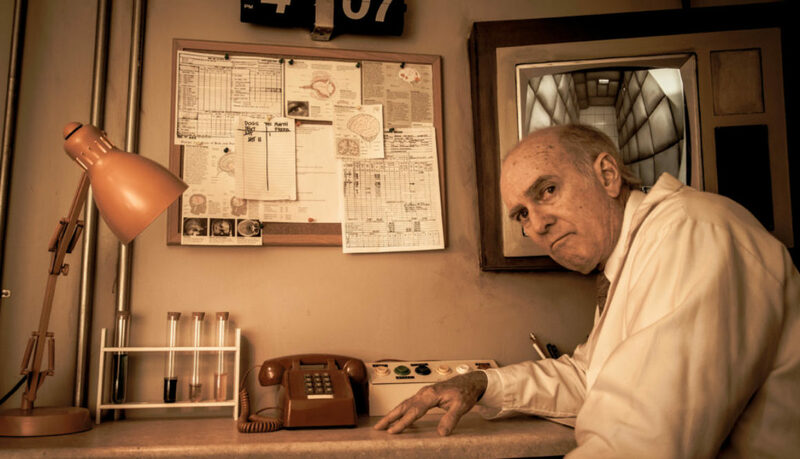 The Asylum is 10 minutes long and for exactly 2 players. You and a partner are strapped together in a straitjacket, thrown in a small padded cell, and forced to work together. You are suffering from split personality disorder; 1 body, 2 heads. Two sinister looking nurses strap you together and lock your straitjacket with an assortment of locks. You must work together with your other half to unlock the locks on the jacket, so you can get to the key and escape. 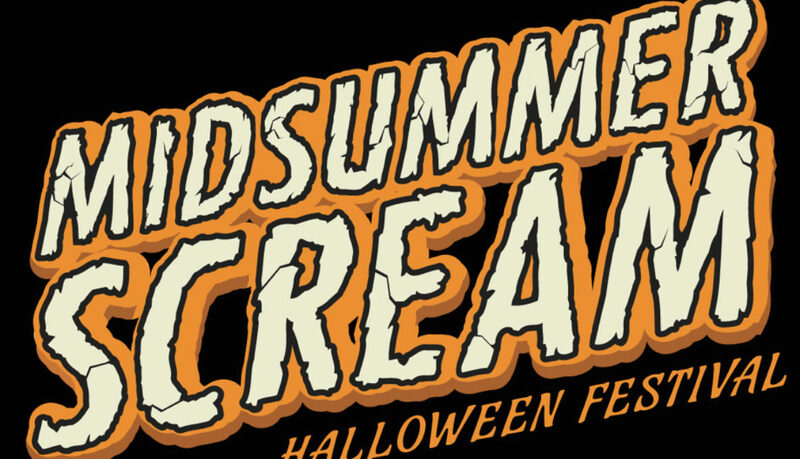 Midsummer Scream is one of the best Halloween Conventions featuring walk through haunts, escape room experiences, celebrity guests, horror themed vendors, and great panels and presentations! 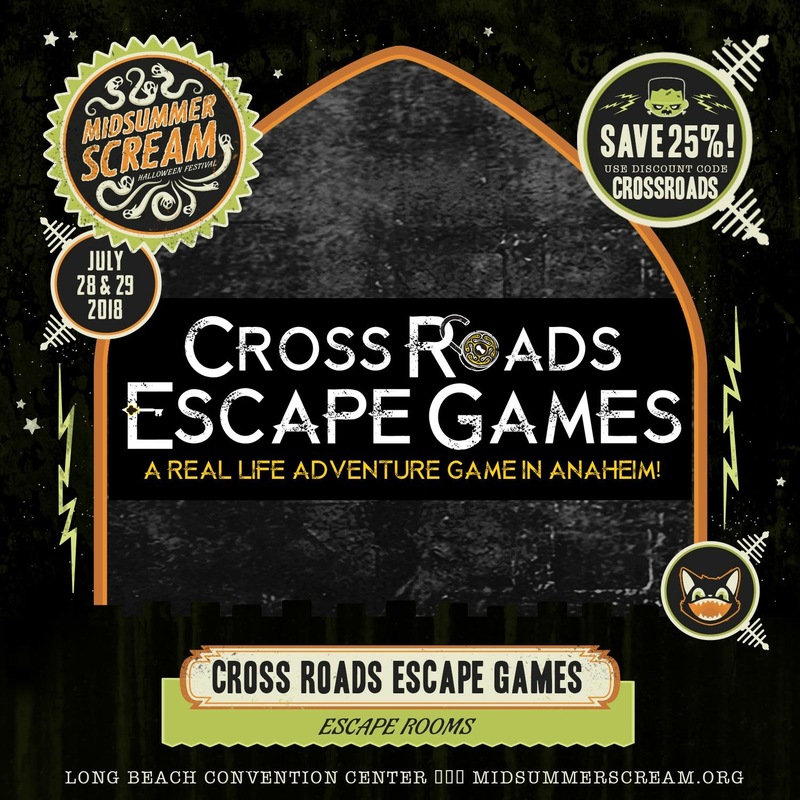 Use the code CROSSROADS to save 25% off your admission tickets to Midsummer Scream! We look forward to seeing you there! Symptoms include: lying, breaking laws, acting impulsively, lack regard for others and other’s emotions. 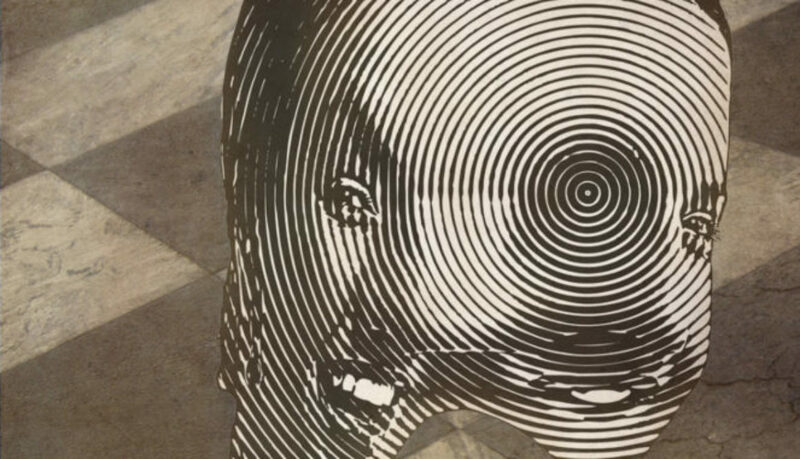 Is it crazy to look out for yourself? To win? To be competitive? Or is it true human nature? What is the line between sane and insane? Who is the one who chooses? 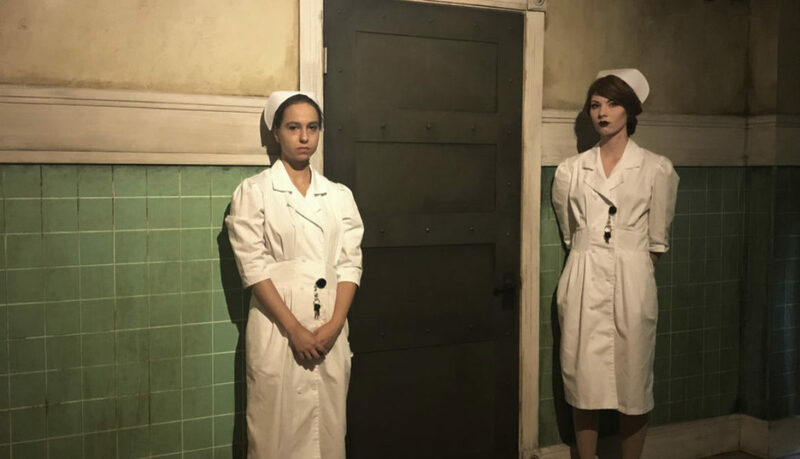 I know we have been keeping a lot of information from everyone about The Psych Ward, and a big reason is because the game play is completely different from most escape rooms. We have a lot of beta testing planned, and we will probably make plenty of changes once we see how people react to this new type of game design. If you are interested in being a tester for this game, please click HERE to enter your email address and we may contact you in the next few months. Theory: If put in a controlled environment, some patients will exhibit more psychopathic symptoms than others. Hypothesis: Patients will lie, betray, and manipulate their friends to get what they want. Experiment: Two groups will be placed in a controlled room with challenges and rewards. To succeed, bonds must be made and broken, as test subjects must outwit the other participants to get the most rewards. Truth is unreliable. Trust must be established. Betrayal is necessary. Difficulty- Every game will have one winning and one losing team. # of Players- 4-8. This is a PRIVATE game. We will not put your group with strangers. Ages- This game is for ages 16+. Click HERE to sign up for our mailing list to be the fist to know when tickets go on sale! Make sure to follow us on Twitter, Facebook, Instagram, YouTube, and Tublr as we reveal more teaser trailers and clues for a special prize! Here it is, the first look at The Psych Ward, our 3rd full length game opening THIS FALL! I know we have been teasing about it for over a year, but now we will be giving you updates all the way until it opens! If you have not yet, make sure to put your email on our mailing list to be notified when tickets go on sale! The Psych Ward has taken the longest to build, and that is mainly because we just don’t like to make things easy on ourselves. As you can tell by The Hex Room, we love creating new and innovative games that no one has seen before! My husband and I have played over 150 escape rooms, and honestly, they are starting to get kind of boring. Don’t get me wrong, we LOVE escape rooms, but after so many, the experience gets dull. But, I can now list some new skills to my resume: expert bank robber, jail breaker, spaceship repair team, and private eye (to name a few). Although these game all have different themes, the challenges and puzzles all feel the same. I feel it is our job as entertainers and enthusiasts to create something new. That is where The Psych Ward comes from. What if you were in an escape room but you didn’t know who was on your team? How would you manage to work together? Would you use your friends for your own gain? Or would you still work together even if you had different motives? These questions were so interesting that we had to dig deeper. 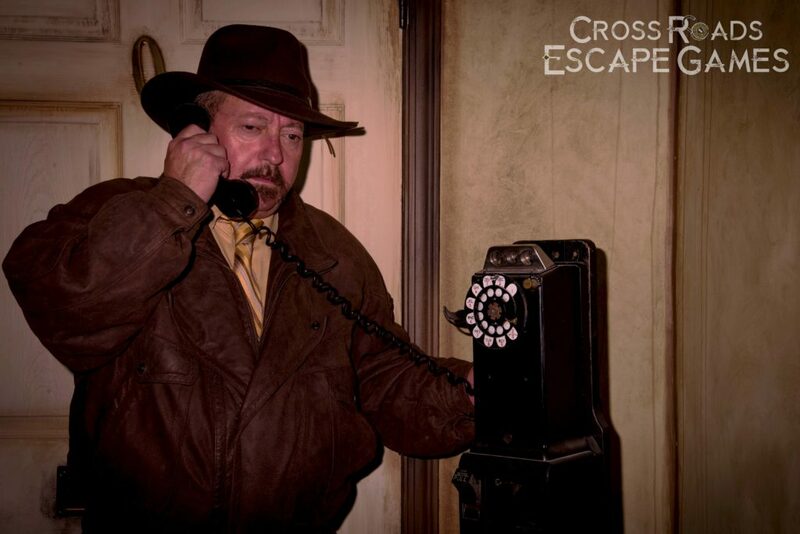 What if one of the puzzles of the escape room was how you choose to play the game? What if we pit teammates together? What if some had information that they could choose to share? 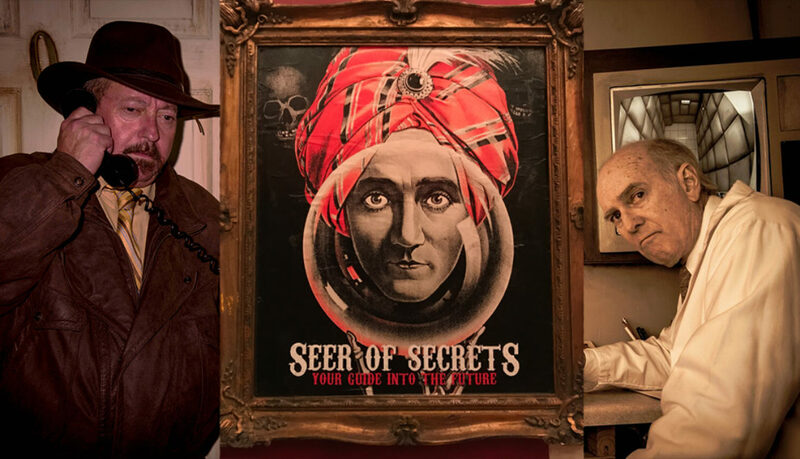 With this new game play, the rules and preconceived ideas of escape rooms become lost, and it is up to you as to how you want to play your game. The Psych Ward is a game of trust & betrayal. Who can you trust? Who will trust you? 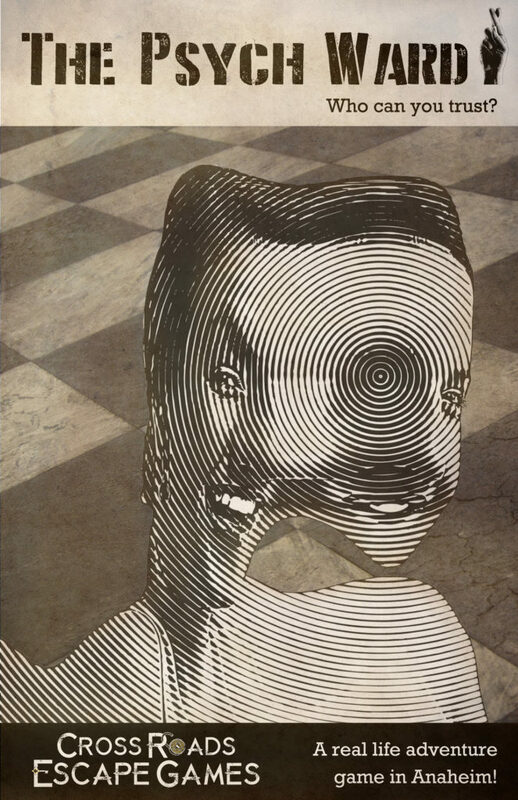 That is just one of the many puzzles inside this thrilling mind game. Take a look at our first trailer below. Make sure to check back as we slowly reveal more videos, pictures, and information to the craziest game you will ever play. I promise you only have to wait a little longer…. Don’t worry, you can trust me. The Asylum is an exclusive 10-minute mini-game created as a teaser game for our up coming full-length game, The Psych Ward. 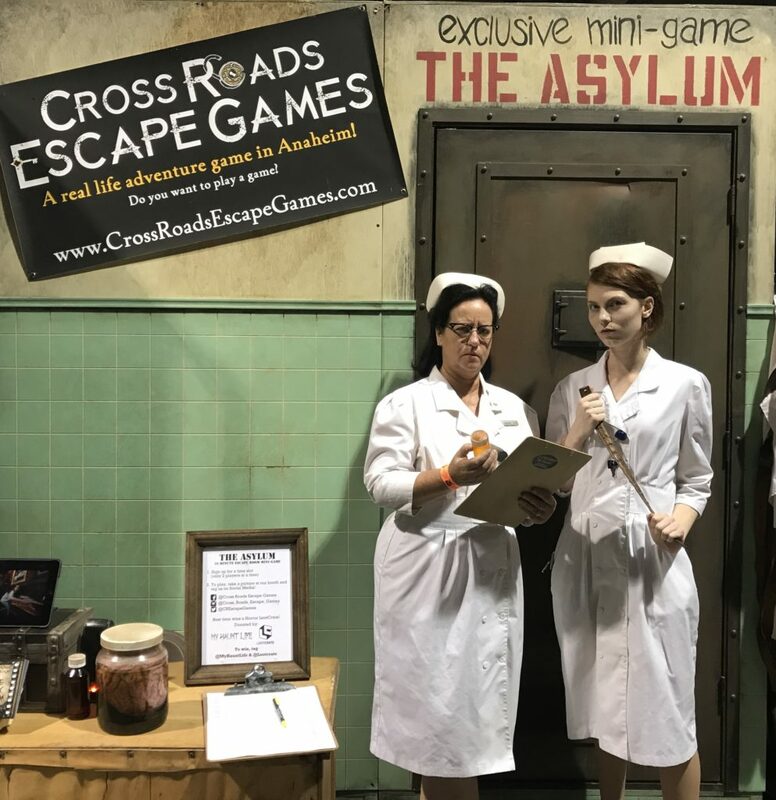 The Asylum mini-game is a mobile game that we take with us to conventions to show new players how fun escape rooms are! 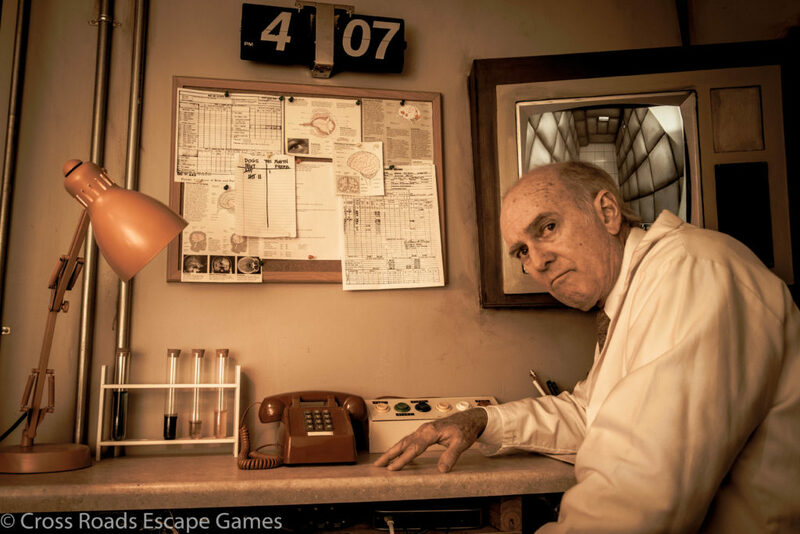 The Asylum is only 10 minutes long and for exactly 2 players. 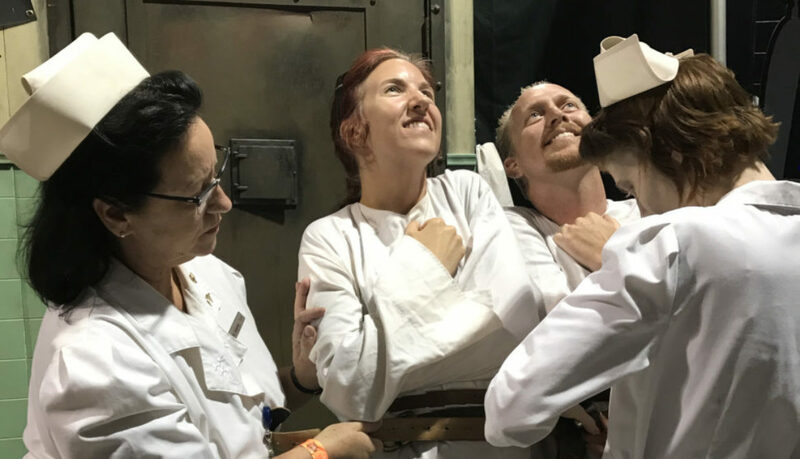 You and a partner are strapped together in a straitjacket, thrown in a small padded cell, and forced to work together. You are suffering from split personality disorder; 1 body, 2 heads. Two sinister looking nurses strap you together and lock your straitjacket with an assortment of locks. You must work together with your other half to unlock the locks on the jacket so you can get to the key and escape. It’s a huge hit at the conventions we have brought it to such as Midsummer Scream and ScareLA. It also has an exclusivity to it that we like, because it only holds 2 people at a time and is only made available a few times a year. Players love this game because it forces them to work with their partner every (literal) step of the way. It’s also fun to unlock locks that are on yourself instead of on boxes or walls. The cell is eerie and dirty with the sounds of screaming coming from another room. 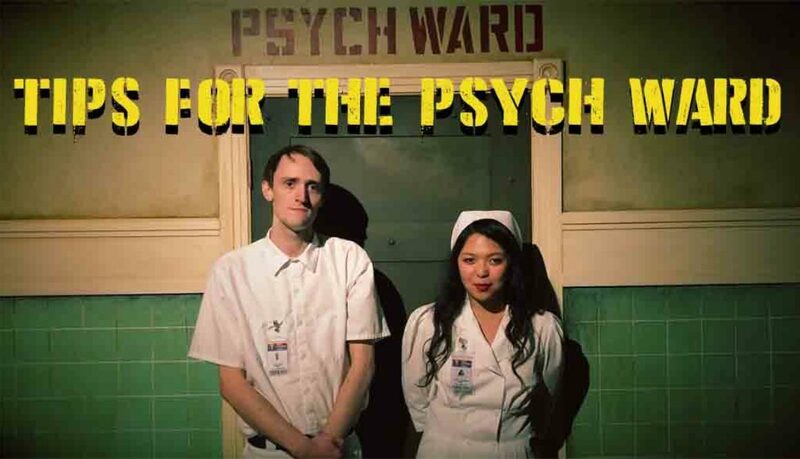 It was created to get people excited for our new mental hospital themed game, The Psych Ward, which will be an hour-long game at our location in Anaheim, and is opening soon! Although there will be no straitjackets in The Psych Ward, it will be in a similar world… and may contain a padded cell. I can’t give away too much but I will say this game is unlike any other escape room you have played.